After an awesome day on “Happy Tyroleans”, Mike headed home and I met up with Guy Robertson that evening for another days climbing tomorrow. 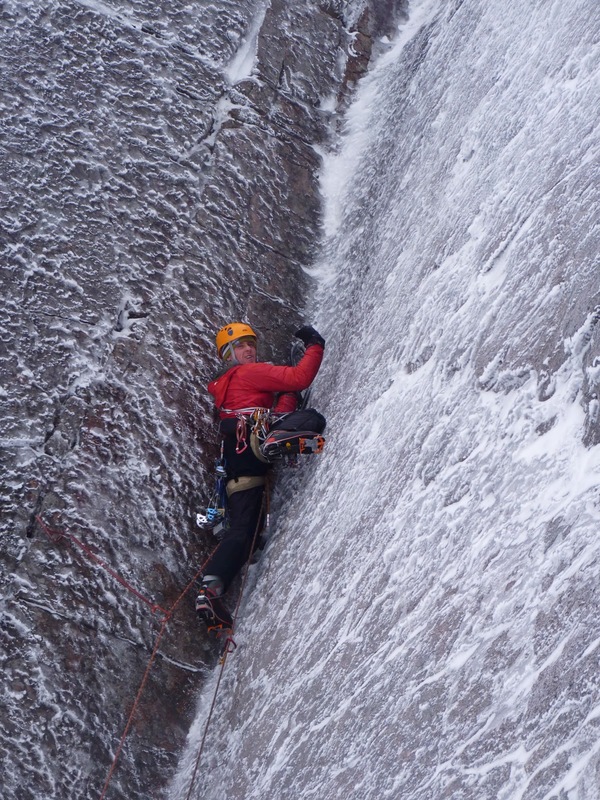 We slept in our cars in the Cairngorm car park and were up bright and early the next morning ready and eager for another days cranking in the mountains. We walked into Lochain under the full moon and reached the Corrie just as the sun was peeping over the mountains. Even though I was a bit tired from the previous day’s antics on “Tyroleans”, I knew it was going to be another good one, and was psyched for our intended project. We where planning on trying a new line in the corrie and this is where we started. 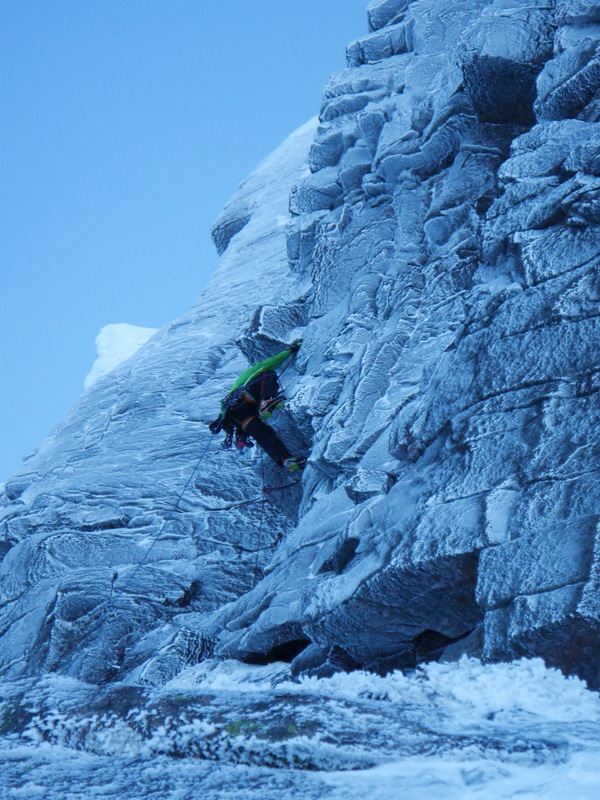 Guy set off up the first pitch and swiftly got stuck into the steep climbing that loomed above. After some ascending and descending on the start of the hard section, it soon became apparent that he wasn’t feeling up to it. Unfortunately for Guy, he has been plagued with a nasty flu virus for most of the winter season and hasn’t been able to shake it off yet. But his psych levels where so high that he just had to get out climbing even though he wasn’t firing on all cylinders! He asked if I would like a go at the pitch, but I said that I thought it would be a waste of time if I had a go as I was also pretty gubbed from the hard previous days climbing! 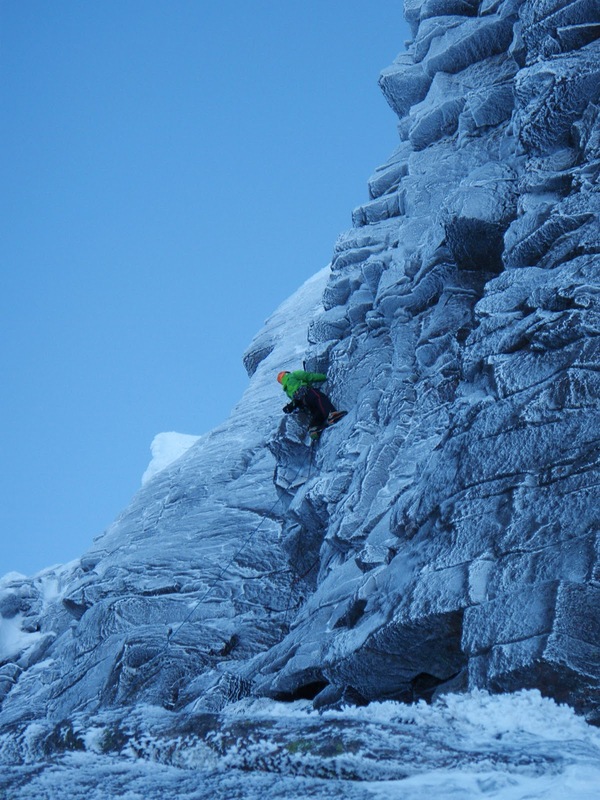 Guy quickly down climbed from his high point and we trotted off to the base of Number 4 buttress. This is where our Plan B was situated. 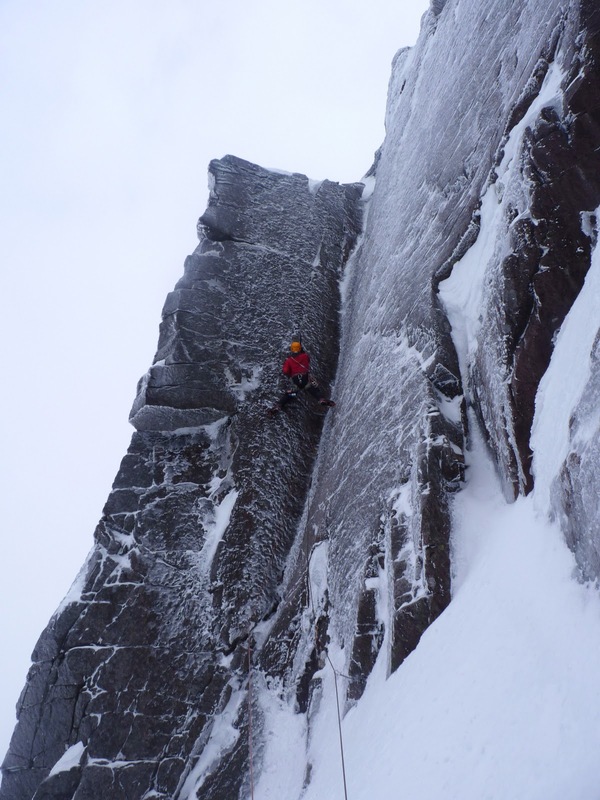 We decided to do “Prore Direct”, a route which was put up by Ian Parnell in 2007. We quickly swapped over the rack and I set off up the start of the pitch, which was home to some very steep moves and it was tricky to get situated over the bulge. I then moved up and left to make a series of strenuous moves to gain the original line of “Prore” on the main face. 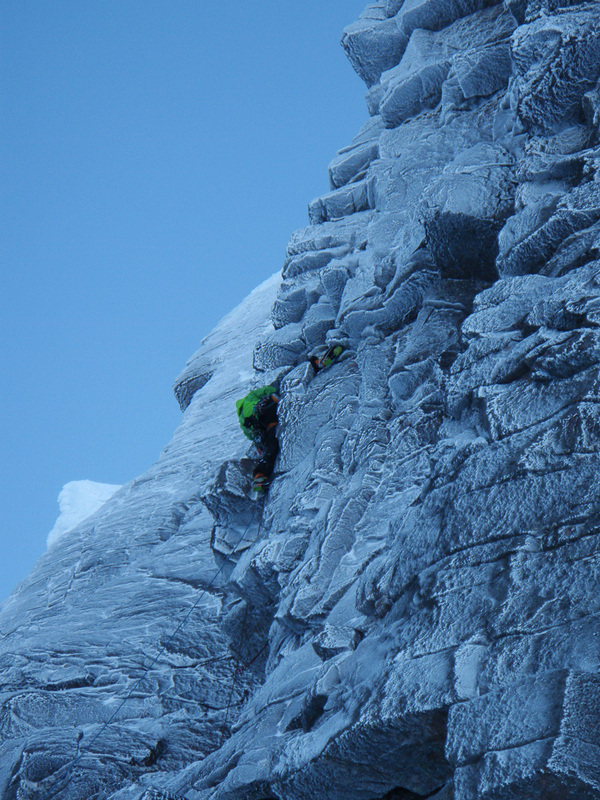 As the guide book describes it had minimal gear but also involved some technical thin moves to reach the arête. Once we had reached the top of the route, we used the rapp station at the top of “Savage Slit” and descended back down to our bags. We then made another relaxing walk to the car under a magnificent full moon. When we reached the car, I got a call from Mike to say he was on his way back up North from Edinburgh and that he was nearly at Aviemore, so we arranged to meet at the chip shop for a quick bite. After dinner, Guy set off home to Aberdeen and Mike and I headed to Fiona Murray’s where we were going to spend the night, ready for yet another day on the hill on Friday. to be to winter climb. On Friday morning Tweedley and I headed into Lochain again, and this time we headed for the route “Inquisition” on No. 2 buttress. As I was pretty much spent from the previous two days in the corrie Mike lead the route, which involved digging through the very iced up corner to try and find some gear. This turned out to be harder than we had thought it would be and even when he found some kit, it would probably not have been any use if he had weighted it! But thankfully Mike cruised the line and was on the easier ground in no time. He brought me up and we then rapped off an in-situ belay back down to the bags and we were on our way back to the car by 1pm. This was a nice relaxing day in the mountains and it was a good way to end an awesome three days climbing. I am now resting up to get ready for another upcoming week of cranking.